For legislative redistricting, the governor submits a plan to the legislature on the January 9, 2002; the legislature then must adopt or amend the plan, or enact a plan of their own by February 23, 2002. There is no deadline for congressional redistricting, but proposed congressional districts are generally submitted by the Governor as a regular bill. The governor and legislature are in charge of legislative redistricting. An advisory commission was used in the 1980s and 1990s, and has been used in this redistricting process as well. The governor has veto authority over congressional districting, but not over state legislative districting. However, if the legislature fails to meet its deadline for legislative districting, the governor’s plan as submitted goes into effect. Since the 1980s, governors have established an advisory commission made up of local public figures to hold public hearings and recommend both state and congressional plans. The commission has no statutory or constitutional authority, but is assisted by state agencies. The General Assembly's website has a redistricting section , which includes a timetable, public hearings schedule, current and proposed plans, and information regarding the advisory committee . Redistricting is likely to be very partisan, with the Democratic Party seeking to maintain its dominance of the legislature and gain a U.S. House seat. The last round of congressional districting required a special session. It was politically difficult — the legislature wanted to create a new black-majority congressional district and still protect Democrats. The 1992 plan forced one Democratic incumbent into a Republican district, however, where the Democrat lost to the Republican incumbent. Republican Congresswoman Connie Morella represents a Democratic-leaning district in suburban Montgomery County, next to Al Wynn’s heavily Democratic district. Democrats may be tempted both to undercut Morella and redraw Republican Congressman Robert Ehrlich’s district to include more Democratic voters if he chooses to run for governor in 2002. There was a bill in the State Senate in 1998 to take the authority for redistricting and return it to the legislature. Maryland and Arkansas are the only two states in which the governor does the redistricting. The bill failed, as did a bill in 2000 to study conversion of the three-seat state house districts to either single-member districts or a proportional voting method. During the last round of redistricting, the governor's congressional district plan was challenged in U.S. district court on both equal population and vote dilution grounds. The overall population variance between districts was only .00167 of a percent -- equal to ten persons. The court upheld the plan, stating that the population variance was acceptable in light of the state's interest in keeping major regions intact, in creating a majority-minority district, and protecting incumbents. The vote dilution claim was based on the plan's separation of Anne Arundel County into four congressional districts. The court also rejected this claim finding that it did not violate federal or state constitutional provisions. The governor's state legislative district plan was challenged in both state and federal court primarily on equal population and political gerrymandering grounds. 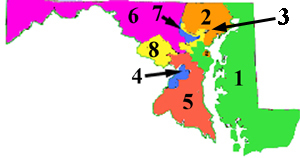 The Maryland Court of Appeals appointed a special master and accepted their finding that the state constitutional requirement that districts have "substantially equal population" was not violated by the plan and that the plan was not a partisan gerrymander according to the principles outlined in Davis v. Bandemer. The federal court challenge alleged charges similar to the state court action. In addition, a minority vote dilution claim was pleaded. The court dismissed the equal population and partisan gerrymandering claims for reasons similar to the state court's arguments. Most of the minority vote dilution claims were also dismissed except in regards to the Maryland Eastern Shore region. In that instance, minority vote dilution of black voters in the region was found and the court ordered remedial steps. The state prepared and submitted a modified districting plan for house districts on the Eastern Shore which included a single-member delegate district with a majority-black voting age citizen population.